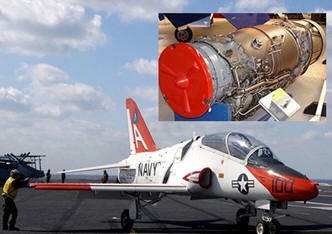 October 10, 2012 - Rolls-Royce, the global power systems company, has been awarded a $103.3 million MissionCare contract by the US Department of Defense to provide support for the F405 (Adour) engines that power the US Navy’s T-45 training aircraft. The Rolls-Royce Turbomeca Adour is a two-shaft turbofan aircraft engine developed by Rolls-Royce Turbomeca Limited, a joint subsidiary of Rolls-Royce (UK) and Turbomeca (France). The engine is named after the Adour, a river in south western France. The contract reflects the continued success of MissionCare support for the US Navy and exercises the fourth option year to provide guaranteed engine availability. This includes support ranging from on-wing through intermediate and depot level maintenance, under a five year base contract that began in 2008. Rolls-Royce uses MissionCare to apply commercial Power By The Hour principles to the unique requirements of the defense industry. Under the terms of the agreement, which is administered by the Naval Air Systems Command (NAVAIR), Rolls-Royce will provide inventory control, as well as integrated logistics support and required engineering elements for both the F405 engine and the aircraft gas turbine starting system. This contract provides comprehensive propulsion services to more than 200 aircraft, operating at four main Naval Air Stations - Kingsville, Texas; Meridian, Mississippi; Pensacola, Florida; and Patuxent River, Maryland. The T-45 Goshawk is a highly modified version of the BAE Hawk land-based training jet aircraft. Manufactured by McDonnell Douglas (now Boeing) and British Aerospace (now BAE Systems), the T-45 is used by the United States Navy as an aircraft carrier-capable trainer. The Goshawk's origins began in the mid-1970s, when the US Navy began looking for replacement for its T-2 and TA-4 trainers. The US Navy started the VTXTS advanced trainer program in 1978. British Aerospace and McDonnell Douglas proposed a version of the Hawk and were awarded the T-45 contract in 1981. The Hawk had not been designed for carrier operations and numerous modifications were required to make it carrier-suitable. These included improvements to the low-speed handling characteristics and a reduction in the approach speed. Other changes were strengthened airframe, more robust and wider landing gear with catapult tow bar attachment and an arresting hook. It features a two-wheel nose landing gear. The Goshawk first flew in 1988 and became operational in 1991. BAE Systems manufactures the fuselage aft of the cockpit, the air inlets, the vertical stabilizer of the T-45 at Samlesbury, and the wings at Brough, England. Boeing, which merged with McDonnell Douglas in 1997, manufactures the remainder of the aircraft and assembles them in St. Louis, Missouri. On 16 March 2007 the 200th airframe was delivered to the US Navy. Their requirements call for 223 aircraft. All T-45A aircraft will eventually be converted to a T-45C configuration under the T-45 Required Avionics Modernization Program (T-45 RAMP).